The Adventures of The Everyday Fangirl welcomes fellow Fangirl Connie Shih as a guest blogger to talk about why representation, diversity and inclusion matters! Patty, thank you so much for the opportunity to write a guest today! Representation, diversity, and inclusion have come to the forefront in recent years as hot topics in pop culture, fandom and society at large. They are multi-faceted, complex topics influenced by a number of factors including background, race and ethnicity, gender, and sexual orientation. Depending on one’s perspective, representation and diversity are either championed or derided as being too political. In the pop culture realm, discussion and debate surrounding representation and diversity have intensified this summer with the record-breaking box office success of Wonder Woman, the announcement of Jodie Whittaker as the 13th (and first female) Doctor in Doctor Who, the diverse cast of Star Trek: Discovery, and the debut of the new Star Wars: Forces of Destiny animated shorts (with accompanying Hasbro adventure figure merchandise). Although welcomed and embraced by many, there has also been vocal and considerable pushback by some who believe that the spotlight on representation and diversity has detracted from the love of THEIR TV show or film franchise. These detractors perceive that inclusion is used to gate keep entry into fandom and franchise, and believe that representation and diversity do not matter. In this guest editorial, I would like to provide a counterpoint to the belief that representation and diversity do not matter by sharing my story and perspective as a 42-year-old Asian-American woman with cerebral palsy who has loved the science-fiction / fantasy genre for 34 years. My intent is not to change minds, but rather invite readers to step out their own perspectives for a moment and consider things from a different point of view. Growing up in the 1980s, my two primary science-fiction / fantasy staples were Star Trek and Star Wars. I was first introduced to Star Wars as an 8-year-old with Return of the Jedi and to Star Trek as an 11-year-old with Star Trek IV: The Voyage Home. Those two films were my entry points into both these long running franchises and in both cases I became an instant fan. The United Federation of Planets and A Galaxy Far, Far, Away captivated me and I wanted to absorb everything about them. My favorite characters from each of these franchises, at the time, were Nyota Uhura and Hikaru Sulu from Star Trek, Princess Leia and Luke Skywalker from Star Wars. I was drawn to them all because I saw a bit of myself in all four characters: Uhura (female linguist and communications officer), Sulu (Asian helmsman), Princess Leia (empowering, take charge princess), and Luke (hero with unwavering belief in his father). In each of these characters, I saw a trait that I could relate to, or someone who I aspired to be. As the Star Trek franchise continued with TV series The Next Generation, Voyager, and Deep Space Nine, my favorite characters were Dr. Beverly Crusher, Geordi La Forge, Keiko O’Brien, and Harry Kim. Once again, I saw a bit of myself represented in each of them, especially with Geordi. I think it was the first time I saw a character with a disability (blindness) in Star Trek. It was incredibly inspiring for me to watch his progress from helmsman to chief engineer of the Enterprise. All of these characters represented my seat the table. Does that mean I didn’t like or identify with other characters within these franchises? No, of course not. In the Star Trek franchise, I liked many different characters based on their traits and story. For example, I liked Dr. McCoy for his southern gentility, wit, and sarcasm just as much as I liked Guinan for her wisdom. Seeing representation on screen added additional layers of relatability and personal investment to the story and franchise. When I do not see myself represented, I feel like an outsider looking in to a certain extent. 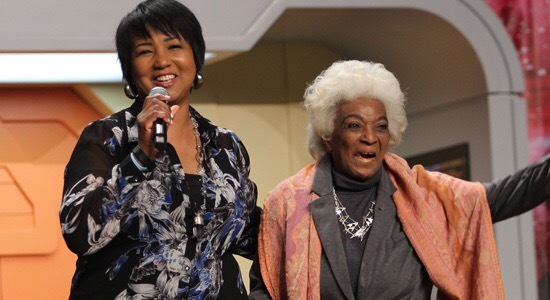 Recently, I was struck by a quote from Dr. Mae Jemison (lifelong Star Trek fan and NASA astronaut) to Nichelle Nichols at the recent Star Trek convention in Las Vegas. Jemison thanked Nichols for being an inspiration and went on to say “You gave me and others permission to be in the room.” Think about that for a moment. Seeing Uhura on TV gave Jemison permission to be in the room. I was incredibly moved by her comment because I felt the same seeing my aforementioned favorite characters on TV and on the big screen. As a young girl, these questions stung like being swarmed by wasps. I cried myself to sleep several times. I just wanted to connect with other kids and didn’t understand why they were being so mean. My parents, bless them, tried to soothe me the best they could. They told me that I still had my imagination and the ability write and draw, so I should keep Star Wars to myself and have fun. I didn’t have Star Wars toys at the time, so I acted out scenes from Return the Jedi with my Barbie and Ken dolls, pretending they were Leia and Luke, respectively. I also hid my love for Star Trek because there weren’t kids my age who liked it and I was already bullied for Star Wars, so why even ask? It was pointless and I did not want to be subjected to another round of heartbreak. It was not until several years later that I came out of hiding with Star Trek and Star Wars. One of my father’s work colleagues had a daughter ten years older than I. Despite our age difference, we had so many life circumstances in common including a love of Star Wars and Star Trek. I can’t tell you how genuinely happy I was to discover another girl who loved both of these franchises much as I did. The floodgates opened and we chatted for hours, talking nonstop about Luke, Leia, and Han and Sulu, Uhura, and Chekov. That was 30 years ago. We remain close friends to this day and still go to see Star Wars and Star Trek movies together. I consider her a science fiction / fantasy kindred spirit and I have her to thank for introducing me to other awesome franchises, such as Doctor Who, Babylon 5, and Stargate SG-1. Much has changed for the better over the past 30 years, especially for the Star Wars franchise. There are now also so many more entry points for fans of all ages to experience Star Wars across multiple mediums (film, animated series, books, comics, video games, virtual reality, and theme parks). Along those lines, I have to say it has been fantastic to witness the number of diverse characters grow exponentially, particularly with female characters. Star Wars now includes Padmé Amidala, Shmi Skywalker Lars, Rey, Ahsoka Tano, Maz Kanata, Satine Kryze, Bo Katan, Steela Gerrera, Korr Sella, Greer Sonnel, Hera Syndulla, Asajj Ventress, Sabine Wren, Ursa Wren, Norra Wexley, Shara Bey, Jyn Erso, Lyra Erso, the Nightsisters, Captain Phasma, Mother Talzin, Dr. Aphra, Ciena Ree, Rae Slone, Arihnda Pryce, Iden Versio, Rose Tico, Amilyn Holdo, and Kordi Freemaker. While their stories have been told (or will be told) in varying degrees, each of these female characters have been introduced in a medium. To say that I am thrilled is an understatement. In addition to female characters, there have been recent attempts to ethnically diversify with Finn, Poe Dameron, Saw Gerrera, Bodhi Rook, Cassian Andor, Baze Malbus, and Chirrut Îmwe. Of these characters, as a disabled Asian American, I connected to Chirrut Îmwe the most because it was refreshing to see an Asian character who wasn’t stereotypically portrayed as a villain and also overcame his blindness. There are now so many more seats at the table and I hope the trend continues because the galaxy is vast with infinite possibilities to tell stories from different perspectives. As geekdom has become mainstream, it is easier for female fans to openly embrace their love of the science fiction / fantasy genre. While bullying and discrimination still exist, we no longer have to hide in shadows. I’m delighted there are companies and online communities such as Ashley Eckstein’s Her Universe (geek fashion) and Jamie Broadnax’s Black Girls Nerds that are thriving because they create spaces where all female fans can connect, step into the spotlight and be proud of their inner geek / nerd. There is also much more merchandise available for fans of all ages to purchase and enjoy. Collectibles, toys and games, action and adventure figures, kitchenware, bedding – all come branded with one’s favorite franchise. While the merchandise was prevalent when I was a kid, it is everywhere now. It’s a wonderful time to be a fan! The futures of both Star Trek and Star Wars are bright with exciting, each with new projects on the horizon. In addition, both recently celebrated milestone anniversaries with Star Trek turning 50 last year, and Star Wars turning 40 this year. I consider both to be legacy franchises as the love for them has been generational. At the same time, we have started to see both (particularly Star Wars) evolve to reflect the society and times they reside in. As author John Knowles said, “Everything has to evolve or else it perishes.” I view representation, diversity, and inclusion (both on screen and off screen) as integral to this evolution, and believe that these three will help both Star Trek and Star Wars continue to stand the test of time. They have the potential to the present new stories to keep things fresh while still retaining the core characteristics of what makes the respective franchises appealing. Potential is the keyword because I acknowledge that representation, diversity, and inclusion alone cannot exist in a vacuum. Ideally, they should be coupled with quality storytelling that resonate with the audience and fans. This is something that the entertainment industry as a whole is currently struggling with, and is subject that is worth exploring in a separate article. Overall, representation, diversity, and inclusion DO matter to me because I believe that everyone has a voice, has the right to be in the room, and has a seat at the table. If you have read this far, I want thank EACH of you for allowing me to share my personal perspective of why representation, diversity, and inclusion matter. I welcome all perspectives and the chance to dialogue with fellow fans. If you would like to reach out, please feel free to reach me at my twitter handle @connieshih. Live Long and Prosper and May the Force Be With You! •	Read: Are We as Inclusive As We Believe We Are in Fan Culture? 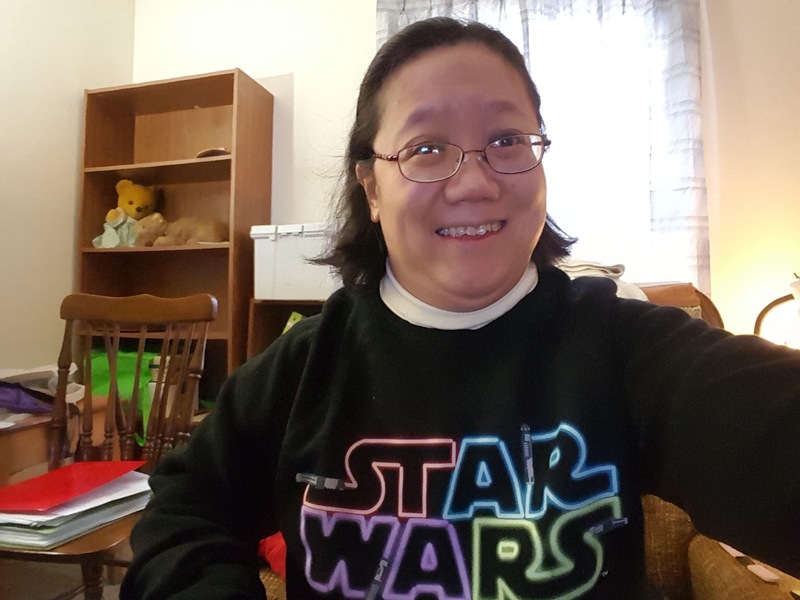 Connie Shih is a graduate student and teacher who loves astronomy and music, is an avid reader, and is a science fiction / fantasy nerd who loves Star Wars and Star Trek. She can be reached at her twitter handle @connieshih.